He is, for many of us, the face of Vietnamese food and travel. His easy manner allows him to present informative yet engaging TV programmes showing Vietnam, its food and its people in a positive and inclusive fashion. I asked Luke about the place of food in Vietnamese culture.”I think everybody in Vietnam is a foodie – it’s so much a part of our culture. Growing up in Australia only a small percentage of people appreciated good food and good produce; it’s getting bigger now, but in Vietnam – indeedin Asia – food is everything. The greeting is ‘Have you eaten yet?’ When we’re cooking breakfast we’re thinking ‘What shall we have for lunch?’ and when we’re cooking lunch we’re thinking ‘What shall we have for dinner?’ That’s my family – that’s Vietnam. “My parents were both brought up in a market, and both their parents’ stallsspecialised in exotic fruits. Mother’s side was lychees, rambutans, mangoes – the smaller fruits; father’s side was durian, jackfruit – the big ones! My parents’ marriage was arranged, because both families were in the business, so they have always been surrounded by great produce, and an appreciation of great food. “When they fled Vietnam my mother was nine-months pregnant with me and I was born on the boat as we landed in Thailand. We stayed in a refugee camp there before going to Australia, and because of theirpassion for good food my parents eventually borrowed enough money to open their own restaurant. I was raised in an area called Cabramatta in south-western Sydney, where there was a big Vietnamese community, and I grew up in the restaurant. “As soon as we could walk we were working, and I had a passion for food and cooking. We didn’t have food suppliers: everyone would go out and buy their own produce, so I learnt how to choose the perfect chilli, or the perfect green mango, and I learnt how to balance the flavours, which is very important in Vietnamese cuisine because it’s so refined. From the age of ten I knew what I wanted to do: I wanted my own restaurant, so I worked towards that. Did Luke think that his young age gave him an advantage? “That’s the time to do it, because you have no fears! There’s nothing to lose – you don’t have children, you don’t own property, a car – what you have is just the money you put into it. If I had to do it again now I wouldn’t do it that way because I have so much to lose, but at that time I had the courage to do it, so why not? The cooking world, the restaurant world, or even home cooking – the beauty of it is that you never stop learning. I find that still, every day, I’m learning about the business. “I think the most important thing is the quality of the product and the way we use it – to respect it and don’t do too much to it, or else the flavours that we put into it have to be very well balanced and elegant. A lot of people ask me: ‘We know about Thai cooking, it’s been around a while – what’s the difference between that and Vietnamese, it’s all part of South-East Asia, isn’t it?’ When I eat a Thai dish it’s amazingly flavourful: there’s the lemongrass, the kaffir lime, the chilli, it’s really a ‘party in the mouth’, quite strong. When you look at the ingredients in Vietnamese cuisine – lemongrass, kaffir lime, chilli, galangal, ginger – they are much the same, but it’s a little softer and more delicate, more refined. Why is it more refined? Take a thousand years of Chinese rule, a hundred years of French colonisation, influences from Thailand, Laos and Cambodia – centuries of taking the best elements of all these to make Vietnamese cuisine. 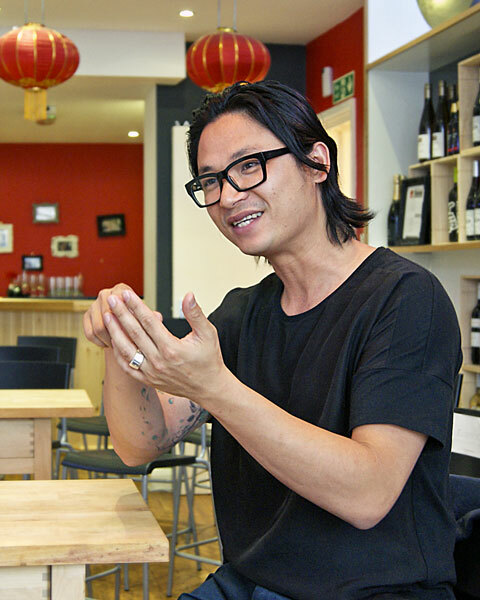 “I find it so fresh and elegant; it has flavour but you have to figure out what it is, and I like that – just a suspicion of something – which is why today Vietnamese cuisine is rising, and will be the next after Chinese, Thai, Japanese. Our culture in the UK and in Australia is about watching what we eat; we’re very knowledgeable about how to eat well, very health-conscious, and Vietnamese is the perfect cuisine for that. It’s light, fresh, lots of raw vegetables, lots of salads, a lot of summer rolls – which is so good for you. The herbs are very medicinal – when I was growing up my grandmother and my mum would say not ‘Eat this because it’s tasty’ but ‘Eat this because it’s good for you – it’s good for this, it’s good for that.’ And the up-side is it all tastes good too. So it looks vibrant, incredibly colourful, it tastes fantastic, and it’s healthy – there’s always a reason to eat something! 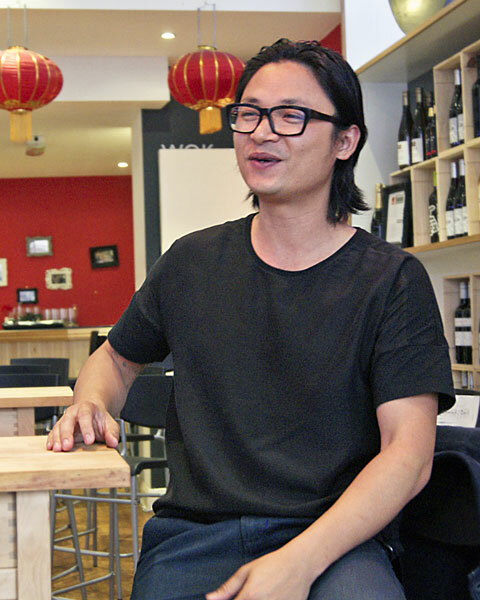 “In Australia, Vietnamese food is popular at the moment. Walking around Londonand seeing what’s available I think it is going to be the next big thing here. I almost want to jump in right now: give me a space, I’ll do a pop-up and show people what Vietnamese food is all about, and you guys will love it, although it may be a little difficult to find saw-tooth coriander, perilla leaf, banana blossom, green mango, green papaya. There is a cross-over between Indian and Vietnamese cuisine. There is a big Indian community in Vietnam, so a lot of our curries are Indian-based. Looking at all the influences in Vietnamese cuisine, don’t forget that the Japanese were there, the Americans, the French, it’s just so diverse. I asked Luke about his restaurants in Sydney. “Red Lantern is essentially authentic Vietnamese cooking but in a restaurantdiningenvironment. Traditionally all the dishes come at once – meat, seafood, salad, vegetable, soup – it all balances out and complements each other, and you eat with rice and you share. At the Red Lantern it’s entrée, second, main course, dessert, wine-matching – authentic recipes but Western presentation. We use the most fantastic local produce: if you have a caramelised snakehead fish recipe and you can’t get snakehead fish, I would use barramundi or perch, so it’s adapting to local produce. The first restaurant, Red Lantern on Crown, is in an old heritage-listed building, with 40 seats, which I opened when I was very young. It was about putting Vietnamese food out there to Australians. Ten years on I had saved up enough to get something bigger, and that is more Colonial French, because my food has evolved. The more research I did, the more the first Red Lantern has become focused onregional Vietnamese cuisines. Now doing more research again, I am looking at the French influence – they were there for a hundred years, how could they not have an impact? I have been to France to reconfirm the connections, and that will be a new TV show, airing in the UK maybe in January or February. So Red Lantern on Riley is very much ‘Indochine’ style, and there’s a bar called Red Lily that offers Asian cocktails. “So I really want to urge the younger generation to keep cooking, which is why my inspiration for my food programmes, my books and restaurants is history – traditional, authentic cooking, heritage, there’s nothing molecular or modern about it. It’s showing not just the young generation but my generation how it’s done. How is rice cultivated? How much work goes into it? How are noodles made? How is fish sauce made? It’s so important to understand those things, to keep the traditions alive. I asked Luke about his earliest food memories. “My earliest memories are of shopping. My parents had a hole-in-the-wall restaurant; they didn’t care about the décor, it was all about the food. I was told that my job was, say, to go and buy two kilos of chillies. So I’d go out and scoop chillies from the stall until I had two kilos, go home, and my mum would scold me: ‘Did you just scoop them into your bag? Get back out there and choose the best chillies!’ So I learnt to buy 100 grams from this shop, hand-picked, 50 grams from that one, and so on until I had the best two kilos in town. In the same way I learnt to pick green mangoes by smell, feel, colour -it was like an apprenticeship. Then you learn to prepare them and balance the flavours. It’s so important in this cuisine to train the palate, and then you understand. “Now, I can taste the expertise of the chef, I can tell where he has been trained by the amount of fish sauce he uses, or oyster sauce – things that you cannot learn by reading a recipe. The biggest challenge is the balance of flavour, and learning the elegance of Vietnamese cuisine. The texture is also important – it has to be right, be it crunchy, crispy, silky, soft, gelatinous, glutinous, the elasticity – it’s a big challenge. 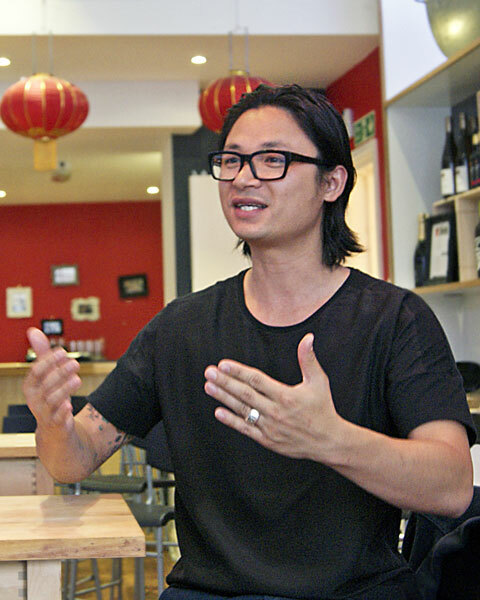 Luke Nguyen has a passion for the flavours, aromas, textures and heritage of Vietnamese food. He conveys the subtleties of dishes and the conviviality of meals. He is a worthy culinary ambassador, and one should not separate the food of Vietnam from its warm and vibrant people.